April is the month to celebrate Easter, but there are lots of other springy things to celebrate too! 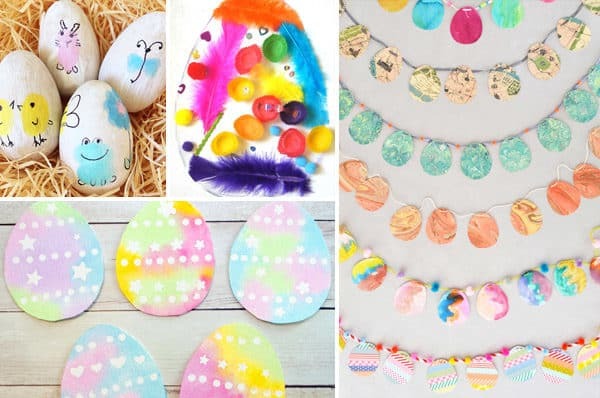 Celebrate Easter and spring with all these gorgeous April crafts for kids. 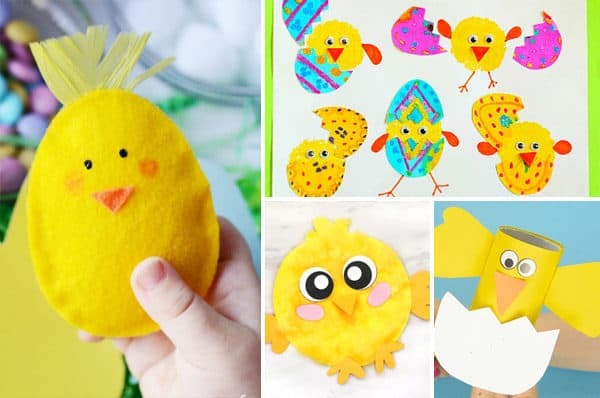 Of course there are lots of Easter bunny and Easter egg crafts on this list, as well as some cute little spring chicks, but there is also some cute rain and umbrella crafts for those ‘April showers’, some daffodils and tulips, and even some spring frogs and tadpoles. 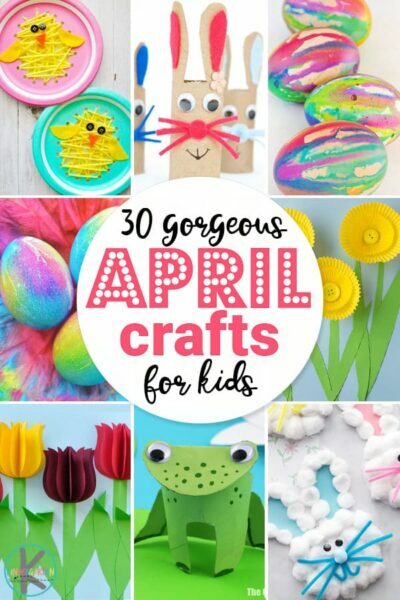 There are enough spring crafts for kids on this list to keep kids busy every day during April! Enjoying our spring crafts for kindergarten? Don’t miss our other crafts for kids! Paper roll bunny craft from Non Toy Gifts. These little bunnies have so much personality! Easter bunny baskets from The Craft Train. These little bunny baskets are perfect for Easter treats and there is a free printable to help you make them. 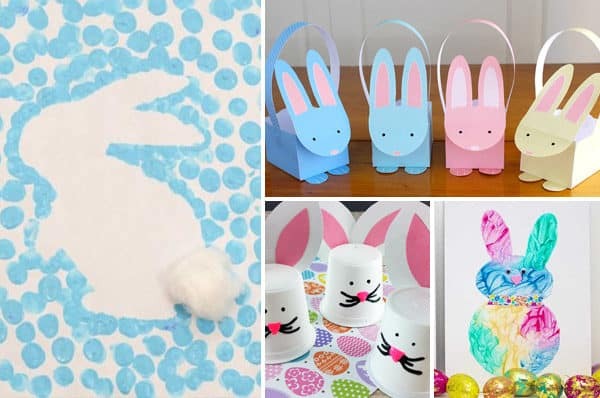 Bunny craft from The Best Ideas for Kids. These gorgeous fluffy bunnies would look great made into an Easter garland! K-cup bunnies from Artsy Momma. This is a great excuse to drink more coffee, so you can make more bunnies! Easter bunny painting activity from My Bored Toddler. Even the smallest children can be involved in this Easter bunny art activity. Easter bunny thumbprint craft from A Dab of Glue Will Do. This is such a fun, hands on, art activity. Free Printable Bunny Ear Hat from 123 Homeschool 4 Me. Super cute craft in color or black and white! Easter egg potato stamps from Natural Beach Living. Do you remember doing potato stamping when you were a kid? This is such a fun way to make easter eggs! Thumbprint Easter egg decorating from Childhood101. This is such a clever way to decorate Easter eggs! Easter egg suncatcher from Laughing Kids Learn. You could fill your windows with this colourful Easter craft! Watercolor Easter egg art with stickers from Projects with Kids. This fun art technique makes the prettiest Easter eggs. Egg garland from Artbar. These garlands are just gorgeous! I’d love to decorate my whole house with them! Tie dye Easter eggs from One Little Project At a Time. These dyed eggs are easy to make and they look spectacular! Drip dyed Easter eggs from Picklebums. This is a super easy, super fun, way to color Easter eggs! Fluffy chick craft from Simple Everyday Mom. This little chick is so cute and fluffy! Hatching spring chicks craft from Buggy and Buddy. This is such a cute craft idea! Chick toilet paper roll craft from Easy Peasy and Fun. Another reason to save those cardboard rolls! Paper plate chick sewing craft from Red Ted Art. This is a great fine motor activity with gorgeous results. No sew Easter chick from Down Redbud Drive. You don’t need to muck around with needles and thread to make this soft little chick. Paper plate frog with a moving tongue from The Joy of Sharing. How cool is this froggy with a looooong tongue! Frog handprint craft from The Best Ideas for Kids. This little froggy comes with his own lily pad and lily flower! So cute! Squeeze ‘n’ croak frog craft from Kids’ Craft Room. 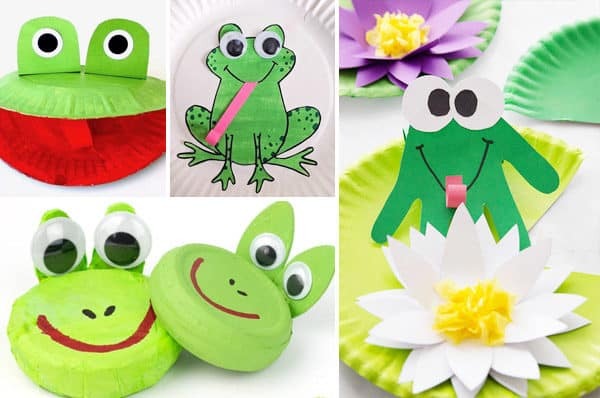 The kids are going to have so much fun making these and making froggy croaks with them! Paper roll frogs from The Craft Train. These cute froggies would be great to use for small world play once you have finished making them. Paper plate frog puppet from Make Film Play. This makes such a happy looking froggy puppet! 3D paper tulip craft from I Heart Crafty Things. This craft idea comes with a printable template so these gorgeous tulips are easy to make. Fork spring flowers from Glued to My Crafts. Make a bunch of gorgeous tulips from plastic forks! Cupcake liner daffodils from Kids Activity Blog. You could make a whole vase full of these gorgeous yellow daffodils. Make a daffodil windmill from Nurturestore. Take these outside on a windy day and watch them spin! 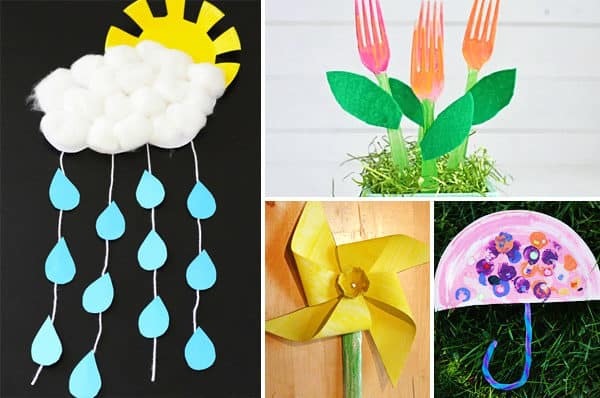 Paper plate umbrella craft from Happy Hooligans. This simple craft makes some gorgeous colored umbrellas. 41 Easter Crafts about Jesus from 123 Homeschool 4 Me. Rain cloud paper craft from Easy Peasy and Fun. Celebrate ‘April showers’ with this gorgeous craft. Coffee filter umbrella craft from Look We’re Learning. What color will your umbrella be? Bubble Wrap Rain Craft from 123 Homeschool 4 Me. Such a fun technique with gorgeous results! Fruit Loop Rainbow Craft from Preschool Play and Learn. This is such a fun, edible craft using fruit loops or skittles. If you are looking for more things do you with your kids during April, check out these awesome April Activities for kids, which include sensory play, learning activities, science and more. 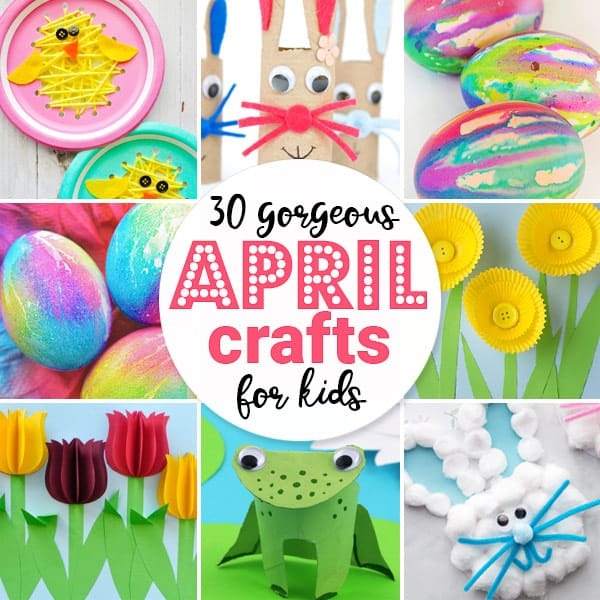 Have fun makings these gorgeous April crafts for kids!